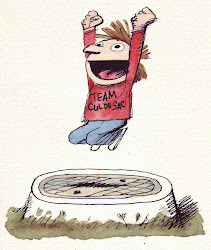 For folks asking me about the Bill Watterson art for The Michael J Fox Foundation/ Team Cul de Sac. Feel free to email me at teamculdesac@gmail.com for other questions. Please share. This is for a great cause. "Calvin and Hobbes sketch and signature by Bill Watterson, approx 2" x 2" - On display Friday night during the Drink and Draw, auctioned off Saturday night at the Art Auction"
Bid on the Bill Watterson Calvin and Hobbes art Auction/Team Cul de Sac Drink and Draw. Chris Sparks will be at AA-724 next weekend at Heroescon. Come by and see him for any questions about TCDS or anything about the Drink and Draw. This year HeroesCon is privileged to display and auction off a copy of the Complete Calvin and Hobbes for Team Cul de Sac and the Michael J. Fox Foundation. This volume features a rare signature and sketch from creator Bill Watterson. There are several ways to bid on this unique item. Email your proxy bids to teamculdesac@gmail.com by 7 p.m. on Saturday, June 16. Email bids received after 7 p.m. on Saturday, June 16 will not be tallied. The piece will be auctioned off live at 9 p.m. Saturday night during the HeroesCon art auction in the Westin Grand Ballroom. Bids may also be placed live starting at 9 p.m. via Heroes' Facebook Live event. Make sure to follow Heroes Aren't Hard to Find on Facebook to participate in the live auction. Further information can be found online at www.heroesonline.com, www.teamculdesac.blogspot.com, and the Information Booth on the convention floor. Don't miss the 8th Annual HeroesCon Drink & Draw Charity Event Friday at 7:30 p.m. at the Westin Providence Ballroom; co-sponsored by Chris Caira and Brian Saucier of www.creatorlaw.com. Come see and bid on live art pieces created by attending HeroesCon artists, with all proceeds going to Team Cul de Sac for Parkinson's Research in honor of the late, great Cul de Sac cartoonist Richard Thompson..
Art supplies and materials will once again be provided by Cheap Joe's Art Stuff, and live music by our friends Jack the Radio.